On view until the end of May 2018 at Skyhouse Apartments, corner of 18th an Lincoln Streets, Denver CO.
Exhibition 'Borderline' curated by Bre Neilson for Artworks Loveland, CO December 2017. With Libby Barbee (left), and Kaitlyn Tuck. Art Prize 9 2017 Down Town Market Grand Rapids, MI. Exhibition 'Vivarium' at Counterpath publishing, Denver CO, June 2017. 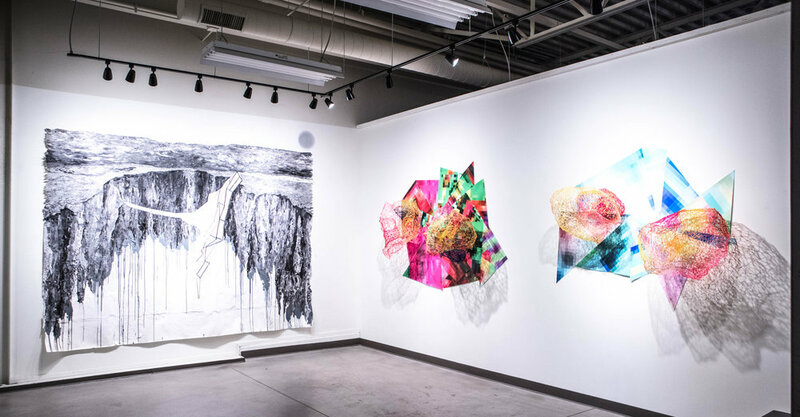 Installation view of 'Forma Futura' exhibition with Jennifer Ghormley, at The Old Masonic Hall, Breckenridge, Colorado March 2016. Installation detail, 'Forma Futura', at The Old Masonic Hall, Breckenridge, Colorado March 2016. Made during 'Morphos Dome Residency' learning the techniques involved in making video content for Full Dome and Virtual Reality applications. The finished installation at 'PoPX' Ann Arbor. A pop-up art event 9/23 - 10/1. Getting ready to ship these pre-made pieces to Michigan for POP X. Sadly my last day at RedLine, my 2 year residency has flown by... what a fabulous pivotal time! On view at The Buell Theatre, Denver, through the end of October, 'The Intrepid Garden' with Suchitra Mattai, John McEnroe, Ashley Williams. 'SuperWicked' 2016, 5' x 3' x 14", ABS plastic filament, 3d pen. Installed at 7S Apartments, Denver - via Ninedot Arts. Erratics, Wall installation all ready to be installed at 'Juxt Apartments' in Seattle, via Ninedot Arts. Here is an image of my works 'Blue Sky #1' and 'Blue Sky #3' were featured on banners at New Mexico State University Art Gallery, Las Cruces May 21st - August 22nd. Student works exhibited at RedLine Gallery's project space. Students work with an artist to produce an exhibition in collaboration with a RedLine artist. Students work reflects issues around Social Justice and are empowered to voice their unique perspectives on issues that are relevant to them. Detail - students from 'Annunciation School' in Denver, made work around the theme of bullying and 'fake-friends'. Works a are life-sized figures made of clear packing tape.